This little restaurant is famous for it’s Japanese Ramen Soups and also serves diverse Japanese dishes. It is a very busy but also a very efficient little restaurant! You order and pay right as you walk in at the counter (like a fast food restaurant) and then you receive a number which you take with you to your table. The waiter then brings your food to the table once it is ready. When you arrive at Bondi Junction you will find an outdoor shopping mall on Oxford Street which is where the Noodle House is located, right after Sports Girl. On their Website/Ichi-Ban Boshi you will be able to find more information about further locations in Sydney, the menu and prices! 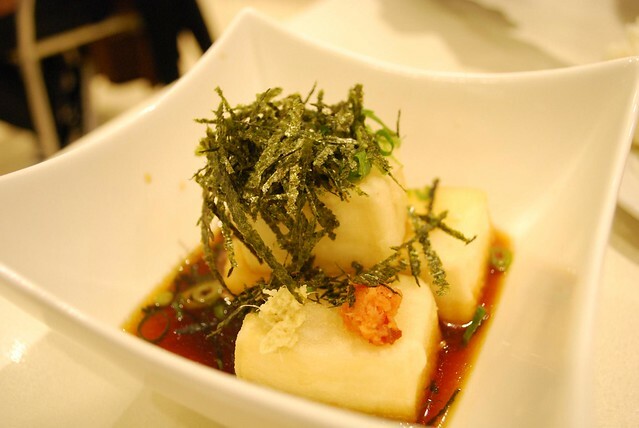 One of my favorite Tofu dishes is the Japanese style fried Tofu as it comes with a sweet tasting sauce. Just make sure you order it without the Bonito- Flakes, as it is made of dried fish! Price 5.50 AUD/ 4.10 USD/ 3.90 EUR. OMG! This Noodle Soup is sooooo delicious! It is packed with Japanese noodles, bamboo shoots, corn, carrots, soya sprouts and is topped with fried Tofu. To add some greens you can order them additionally. I usually add seaweed for omega 3. Price: 11.90 AUD/ 8.90 USD/ 8.40 EUR. I tend to alternate each visit with the soups 🙂 The difference here is that the broth is a salty vegetarian broth and it is packed with loads more veggies than the Tofu Ramen consisting of bamboo shoots, cabbage, carrot, corn, soya sprouts and noodles. ***NOTE: To make the soups vegan let the waiter know you want Udon Noodles as otherwise they add egg noodles and vegetarian broth! There are always delicious, packed with loads of veggies and sooooo filling. You never walk away hungry and I always end up eating everything to the very last drop!! Ready to travel for delicious food? To fly within Australia check out Jetstar.com for cheap internal flights! If you come from overseas compare prices using Skyscanner.com as well as Expedia.com to find the best deals. In general I love using Google Flights to find out the best date to fly as it truly makes a difference in prices! For more tip on how to save money, click here! Looking for accommodation in Sydney? Sydney is one of the most expensive cities to stay so I would suggest to first check out AIRBNB/Australia. Check out booking.com/Sydney as well as Agoda.com/Sydney to find deals on hotels, hostels and apartments in Sydney. More on how to find the best hotels and prices here! Live your Dream Life Part 3: Six Minimalist ways to save money!